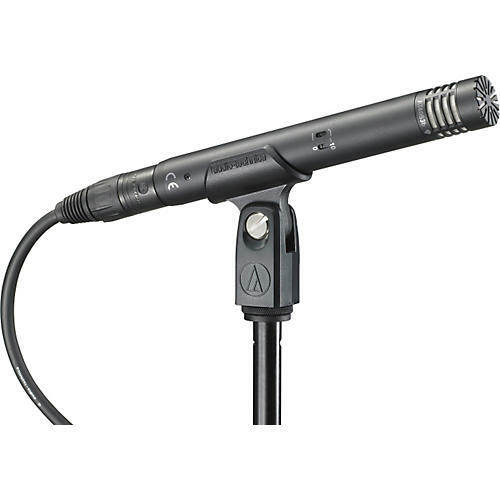 The Audio-Technica AT4053B is a hypercardioid condenser microphone that you can use with confidence in a wide variety of professional miking applications. Featuring direct-coupled balanced outputs for clean signals in high-output conditions, the AT4053B mic is totally free of the distortion associated with conventional transformer-coupled outputs. And its fast response to transients contributes to the open, transparent reproduction of even the most difficult-to-capture instruments. The microphone is fully RoHS-compliant-free from all substances specified in the EU directive on the reduction of hazardous substances (RoHS). The Audio-Technica AT4053B consists of two modular subassemblies: an AT4900b-48 body and an AT4053b-EL hypercardioid head capsule. The excellent rear rejection of the AT5053B's hypercardioid pattern makes it great for live sound instrument recording, where additional rear-rejection is required.